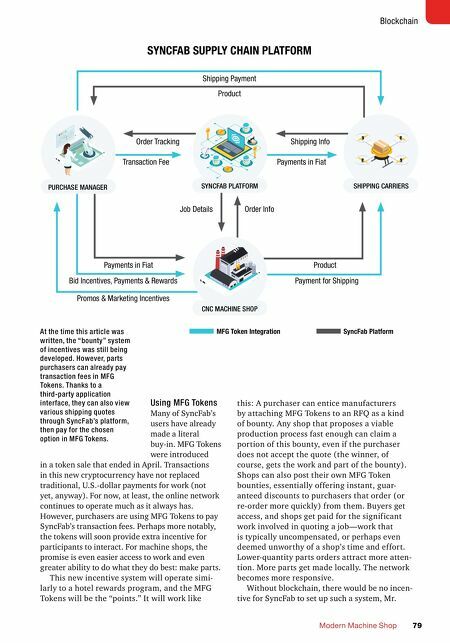 DATA-DRIVEN MANUFACTURING MMS OCTOBER 2018 78 mmsonline.com is exchanged online between virtual "wallets." Whereas traditional currency is traded through banks, cryptocurrency is transferred directly from one party to another. Records of all transactions are automatically encrypted (hence the term "crypto") into strings of code. The code can be cracked only with unique, virtual "keys" associated with the wallets involved in the exchange. Together, these records form the block- chain, a shared, digital history of all transactions ever conducted with any given cryptocurrency (in this case, MFG Tokens). More specifically, groups of cryptocurrency transaction records are bundled together into "blocks" that are then linked together in chronological order. Cryptographic links and time stamps make the blocks inseparable. This chain of blocked trans- action data is not stored in a single, centralized location, like a bank ledger. There is no master copy of the transaction history, nor any central authority debiting and crediting accounts. Every participant's computer (in this case, every MFG Token user's computer) can host its own auto- matically and continuously updating copy of the entire blockchain. In this way, each cryptocurrency user's computer acts as a check on the others. The need for broad consensus on the content and chronology of the records makes the system inherently resistant to any attempt at fraud (say, using the same digital coins for multiple transactions). After all, a distributed ledger presents no single point of access. It also does nothing to prevent everyone trading in a given cryptocurrency from seeing every transaction, but the aforementioned "keys" keep amounts, identities and other details private. Anyone hoping to break into or alter the distributed database would have two choices: convince the majority of users to join in, or hack the majority of users' computers, even as those computers continue to synchronize the constantly growing blockchain. SyncFab, of course, is interested in more than just monetary transactions. Blockchain's great promise is that a distributed database can be more than a bank ledger. It can be a platform for storing and exchanging records of virtually any transaction or asset, from RFQ details and order histories to design revisions and inspection-device calibration reports. As such, blockchain could be as important to the industry's future as advances in artificial intel- ligence, robotics and other technologies widely credited for driving the fourth industrial revo- lution, Mr. Goodwin says. However, bringing a truly decentralized, peer-to-peer manufac- turing ecosystem into existence requires wide- spread buy-in. Manufacturers need to get past their uncertainty and their fear about this new and unfamiliar technology. Blockchain could make sourcing parts as easy as using a ride-hailing service like Uber or Lyft. An analogy to managing a traditional checkbook makes blockchain easier to under- stand: gbm.media/blockbasic. STILL CONFUSED?